As a fully waste management company, WRS is fully in support of waste recycling. 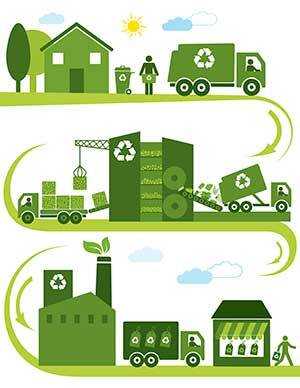 According to EschoolToday, waste recycling is processing used materials (waste) into new, useful products. This process is done to to reduce the use of raw materials that would have been used. The process ideally starts at the household level where the waste was created. In highly developed nations, consumers are given bin bags by authorities that have labels. Households will then sort the waste and place it in the right bags for collection, which makes it less difficult. When all the waste has been collected, it is sent to a recycling unit where all the waste from each type are combined, crushed, melted and processed into new raw materials. It protects the environment – The reason being the waste recycled would have been burned or ended up in the landfill which results in pollution. By recycling waste, the pollution of the air, land, water and soil is therefore reduced. Conservation of Natural Resources – By recycling, it means we do not become dependent heavily on natural (raw) resources which are already facing depletion. Energy Conservation – Did you know that it takes so much energy to produce items with raw materials than from recycled materials? This means we are more energy efficient and the prices of products can come down. Job Creation – A lot of people are gainfully employed in the collection, sorting and work in recycling companies. Some more also benefit in businesses that work hand in hand with these companies thereby creating a ripple effect.